↑ "Timeline: Equal Rights Amendment, Phase One: 1921–1972." (ইংরেজি ভাষায়) ওয়েব্যাক মেশিনে আর্কাইভকৃত ডিসেম্বর ৮, ২০১২ তারিখে feminism101.com. Retrieved: June 4, 2012. ↑ Francis, Roberta W."The History Behind the Equal Rights Amendment." (ইংরেজি ভাষায়) equalrightsamendment.org, July 21, 2011. Retrieved: June 4, 2012. 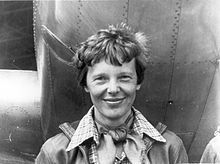 ↑ "The Mystery of Amelia Earhart." (ইংরেজি ভাষায়) Social Studies School Service, February 10, 2007. Retrieved: July 12, 2017.